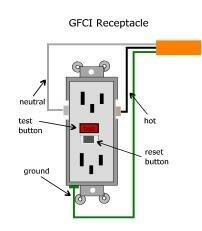 A ground-fault circuit interrupter, or GFCI, is a device used in electrical wiring to disconnect a circuit when unbalanced current is detected between an energized conductor and a neutral return conductor. 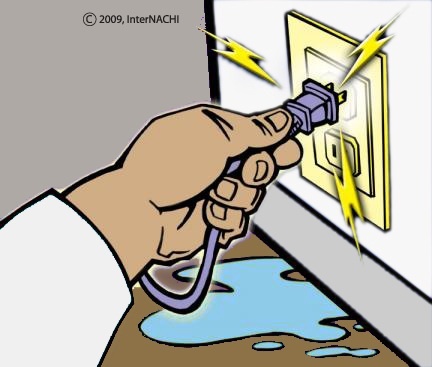 Such an imbalance is sometimes caused by current "leaking" through a person who is simultaneously in contact with a ground and an energized part of the circuit, which could result in lethal shock. GFCIs are designed to provide protection in such a situation, unlike standard circuit breakers, which guard against overloads, short circuits and ground faults. The first high-sensitivity system for detecting current leaking to ground was developed by Henri Rubin in 1955 for use in South African mines. This cold-cathode system had a tripping sensitivity of 250 mA (milliamperes), and was soon followed by an upgraded design that allowed for adjustable trip-sensitivity from 12.5 to 17.5 mA. The extremely rapid tripping after earth leakage-detection caused the circuit to de-energize before electric shock could drive a person's heart into ventricular fibrillation, which is usually the specific cause of death attributed to electric shock. The 1980s saw additional requirements implemented. During this period, kitchens and basements were added as areas that were required to have GFCIs, as well as boat houses, commercial garages, and indoor pools and spas. New requirements during the '90s included crawlspaces, wet bars and rooftops. Elevator machine rooms, car tops and pits were also included at this time. In 1996, GFCIs were mandated for all temporary wiring for construction, remodeling, maintenance, repair, demolition and similar activities and, in 1999, the NEC extended GFCI requirements to carnivals, circuses and fairs.